Companies participating in the self-regulatory programme should use the ‘AdChoices Icon’ as a means for providing enhanced notice of OBA practices to consumers. Any company involved in data-driven advertising, including first and third parties, may apply to start using the Icon. Definition – A fundamental principle behind the European self-regulatory programme is for entities engaged in data-driven advertising to clearly inform consumers about their data collection and use practices through enhanced notice, provided via the consumer-facing ‘AdChoices Icon’. Companies participating in the programme may use the AdChoices Icon with approved accompanying text for each European market. Details of this text and other technical guidelines for integrating the Icon are contained in the Technical Specifications for implementing the IAB Europe OBA Framework and EASA BPR in Europe. Allowing ads to be placed on its owned and operated website(s) by third parties that use OBA data. Collecting data online for OBA purposes or use OBA data to deliver ads. Please find more information about the participation fees here. Please use the form here to submit your application for using the AdChoices Icon. After submitting the online application, you will receive a confirmation email with the appropriate participation agreement(s) to complete the registration process. Delivery and use of the Icon will be contingent on the execution of a participation agreement and receipt of payment (if applicable). If you are actively involved in Third-Party OBA by using OBA data to deliver ads on websites that you do not own or control, then you should apply to start using the AdChoices Icon. If you are actively involved in Third-Party OBA by collecting data for OBA purposes from websites that you do not own or control, then you should integrate on the Consumer Choice Platform. If you collect and use OBA data from websites that you do not own or control, then you should both apply to start using the AdChoices Icon and integrate on the Consumer Choice platform. If you place ads through Third Parties (such as an advertising agency or ad networks) and these parties collect and/or use OBA data to deliver your ads, you should ensure that such partners already provide clear notice of their OBA practices. It is recommended to discuss this with potential partners and require their participation before entering into contractual agreements. If you actively collect data for OBA purposes or deliver ads to consumers based on OBA data, you may also register for the Consumer Choice Platform. Definition – Integration on the Consumer Choice Platform is available for companies actively engaged in collecting OBA data and/or delivering OBA ads. “Integration” means that your company will be added to the list of participating companies who offer consumers choice and control, by giving them the ability to turn off (or back on) online behavioural advertising. The Consumer Choice Platform is aimed at empowering consumers whilst protecting OBA for businesses as a responsible advertising practice. Registration is a two-phased process. Firstly, submit your company interest by completing the form here. We will then review the suitability of your application and contact you, using the information provided, with further details. Within 6 months of starting to use the AdChoices Icon or being integrated on the Consumer Choice Platform, participating companies will be required to self-certify their compliance with the European Principles. The self-certification of compliance shall be limited to those requirements applicable to each participating company’s business model; however, should a company be subject to multiple obligations, the self-certification must cover all such applicable provisions. In other words, if a company fulfils more than one role in the advertising eco-system, then it should comply with the requirements applicable to each of those roles. Note: the self-certification of compliance under the Self-Regulatory Programme does not exempt companies from fulfilling their obligations under applicable national laws. Using the PDF version which is available for download here. This form represents the technical means for companies to submit their self-certification of compliance to EDAA. 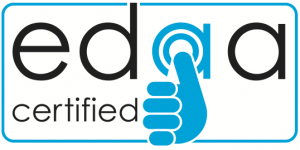 The data collected via this form will only be used by EDAA and by approved Independent Certification Providers, and only for the specific purpose of ensuring compliance with the Self-Regulatory Programme. Within 7 months of licensing, all “Third Parties” must independently verify their compliance with an approved Certification Provider. Certification Providers will grant successful companies a renewable Trust Seal, owned by EDAA, which will act as a representation to the market and to consumers that the company is fully compliant with the Self-Regulatory Programme. This trading seal is envisaged to have a significant market value to compliant businesses, conveying a sense of trust and good standing from consumers and business partners towards the company that receives it. Effective compliance and enforcement is a key aspect of the Self-Regulatory Programme and the independent certification process will enable comprehensive information to ensure that consumer complaints addressed to national Self-Regulatory Organisations (SROs) across Europe are handled in a consistent and efficient manner. Companies should be aware of the national SROs in countries where they operate, a list and contact details of which can be found on the European Advertising Standards Alliance (EASA)’s website.